It is character that rules in nations as in individuals. Only in loyalty to the old can we serve the new; only in understanding the Past, can we interpret and use the Present; for history is not made but unfolded, and the Old World is ever present in the New. — Benj. Ide Wheeler. "The life of all those nations that form a part of history, oscillates during the Primeval Period, between two poles," Baron Bunsen remarks. "By the simple action of these, the feeling of a national existence is developed. One of these poles is Language, the other Religion." Without language, he affirms, that there can be no religion, and without the intuitive consciousness of a God there can be no connection between the essence and the modes of Being, the esse and existere of Swedenborg; consequently, no proposition or affirmation, no word and no language. Hence, he adds: "Without the two, Religion and Language, no science, no art, no sense of human community can exist; and therefore, no development of civic quality, no history." 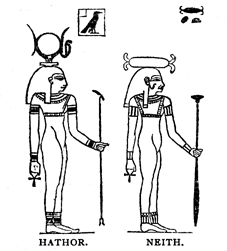 As if in accord with this canon, the accounts of Egypt began with traditions of the archaic rule of the gods, and accomplished Orientalists have interpreted them as indicating a migration from Asia in some prehistoric period. This may be true, to some extent, so far as relates to the Northern region, but it appears utterly improbable in so far as it concerns the Thebaid. The Koptic physiognomy is Caucasian and many of the divinities were worshipped in that region by names that had a resemblance and signification like those of their counterparts in other Asiatic countries. This, however, has not been demonstrated. The families themselves were religious groups with eponymic ancestors whom they honored and commemorated with rites, prayers and offerings at stated periods. Each district, or nome, had in its chief city a Temple at which the patron god was worshipped together with his consort and third hearth-sharer. In short, there was manifested in that far-distant period of undefined ancientness, what Bunsen has so eloquently described as "the pure apperception of God as detected in the human soul as Law by reason and as God by conscience." The traditions of the prehistoric period divide the gods who ruled over Egypt into two groups, the group of Ra and that of Osiris. Both are associated alike with sun-worship, yet exhibit an intrinsic difference in character. The worship of Ra had its centre at Heliopolis, and that of Osiris at Abydos. Yet, in framing the respective legends a father is assigned whose ascendency preceded this principal divinity of the group, as in the Homeric theology, Zeus is made the son and successor of Kronos. Accordingly the traditions of Lower Egypt placed as the first of the series of Divine rulers, Ptah, the god of Memphis. He was the demiurgus, and was denominated the "Father of the Universe," and the "Lord of Truth." The name, however, seems to be likewise a Semitic term, (1) and signifies the opener, the revealer and interpreter (2) and thus he who brings the ideal into activity. After the development of a more complete philosophic system, he was represented as coming forth from the mystic Egg which contained the Universe. Sometimes, also, he was placed at the potter's wheel like Neph and Amun of Thebes, to fashion the Egg into a perfect creation. He was likewise depicted with the figure of a mummy holding the Nilometer and whip. His daughter, Ma or Thmei, the personified Truth, was inseparable from him, indicating, as Iamblichos has expressed it, that he created all things with truth. His consort was Sukhet or Bast, the Artemis or Diana of Egypt who was the chief divinity of Bubastis. (3) She was represented with the head of a lioness, and likewise with a human visage, with the horns of the moon and the solar disk surmounted with the royal asp, two ostrich feathers and a vulture. The latter was the symbol of Motherhood, the former of sovereignty; and she was worshipped as "Queen of Heaven" and "Mother of All." The god Emeph, (4) Imopht or Imhotep, the Egyptian Esculapius and god of the superior knowledge was the third in this group. Ra the personified Sun, was evidently the Semitic divinity Ra or II of ancient Babylon or Bab-El. His terrestrial reign and that of the gods who represented him in various attributes, was considered as actually the same Golden Age. To this period all looked back with regret and envy; and whenever anyone desired to indicate the superiority of anything, it was enough to affirm that "its like had never been seen since the days of the god Ra." He seems to have had no consort like other divinities; and, in fact, the others were only Ra himself, manifested and personified under different forms and conditions, as if to signify the Sun in its various offices, attributes and periods of the day. After the newer arrangement of Thebes had been established, he was named and his symbols placed in combination with those of the divinities of Southern Egypt, as Amun-Ra, Num-Ra, Khem-Ra, Sebek-Ra. Thus was indicated their essential sameness and also that these various personifications related only to qualities and attributes, and not to any real distinct individuality. Ra was also commemorated in an indefinite variety of forms. One was a human figure with the disk of the sun upon the head, which was often entwined by a serpent to typify the motion of the sun through the sky. Another had the head of the hawk, a symbol alike of the sun and of the Supreme Over-Soul. Hence the Temple-scribe or hierogrammat expounded its purpose: "He that has the head of a hawk is the Supreme God. He is the First, indestructible, everlasting, unbegotten, indivisible, absolutely unlike all else, the possessor of all excellence, uninfluenced by gifts, best of the good and most sagacious of the shrewd; He is the father of social order and justice, learned of himself, initiated, perfected, wise, and the first who possessed the sacred occult knowledge." Shu, the "first born son of Ra" was the next of these divine rulers of Egypt. He was as his name implies the personification of Ra, as Light, and also as the cosmic or electric energy. He was styled by Manetho the Agathodaemon or good divinity, a title afterward given to Neph by the Gnostics. Tefnu, his twin sister, was his consort, and Tum or Atum, the Sun of night and of the world of the dead, completed the triad. These three gods, however, were only forms of Ra, and the brazen serpent was their symbol. After the establishment of the first dynasty the religious influence of the Thebaid was paramount, and the group of divinities personified and represented by Osiris, to a great degree superseded and absorbed that of Ra. The gods of the North were overshadowed and the others became supreme and so were named no more as lords of Egypt. 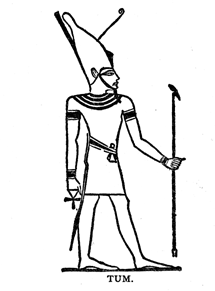 In one hand he held the ansate cross (8) in the other a papyrus-sceptre. The horns of the goat signified the soul, ba the Egyptian name of that animal also denoting the soul, while the sheft or ram implied the creator or fashioner. Neph was the spirit that hovered over unorganized matter and imbued it with life. Hence he was depicted in the Temple at Phike: "Num. who fashioned on this wheel the divine body of Osiris, who is enthroned in the great hall of life." He was also called Num-Ra, "who forms the mothers, the genetrices of the gods." At Esne he was represented as forming the human race upon his wheel and likewise as creating the sun and moon, the world and all things. After the union of the two crowns of Egypt, the chief divinity of Memphis, Ptah, was regarded as originating from him. Porphyry, the philosopher, has shown this in a tradition that Ptah the Demiurgus was born from the egg that issued from the mouth of Neph. The Gnostics also represented this divinity by the figure of a huge serpent, with a lion's head surrounded by a halo of seven or twelve rays. They also gave him the title of Agathodaemon or good genius. His associates were the goddesses Sati and Onka or Anuki. The latter goddess was worshipped in Boeotia, as a form of Athena and she presided like Hestia at the hearth. Writers differ in regard to which of the two was regarded as the consort, but Sati appears with him in various representations, though sometimes, apparently as a ministrant. The social condition of Egypt in the primeval period was patriarchal. Every city and nome or district was a commonwealth by itself, with its own triad and circle of gods, and its peculiar worship and traditions. These gradually approximated one another till the influence of central places effected their union in a pantheon. Under that of the North the divinities in the group of Ra, the Sun-god, become predominant, but in process of time the cult of Osiris from the South came into the ascendent. The traditions were changed accordingly. This new phase was indicated by the legend of the reign of Seb, the Egyptian Kronos. This divinity was described as lord of the Earth and also of time, and as the Egyptians believed in the perennity of time, he was the lord of all the past. In tact, Seb seems to have had a realm extending all over the earth. Sir Hyde Clarke finds his name in America, (9) as Sibu in Costa Rica and Shivatt in Mexico, as Sobo and Nizob with African tribes, in Siva the aboriginal non-Aryan god of India, and Sabazios (10) the Attis or "Great Father" in Asia Minor. Although the hierogram of this Divinity was the goose in Egypt, the symbol most general in the different countries was the serpent. (11) It was employed in the sense of a benefactor, the giver of life and wisdom, but also in some countries and circumstances, as a malefic power. Isis, his consort, the "goddess with a thousand names" was of the same rank and function as the Oriental Istar or Astarte. Though comparatively unimportant in earlier times, she became after the Hyk-Sos period, the more important of the two. Set, Seth or Sut, the brother (17) and successor of Osiris has been supposed to represent the Egypt of the Delta, as Osiris represented the older country of the South. In fact, his worship was predominant in Lower Egypt long before that of Osiris. His designation signifying "kin" in Asiatic dialects, aids to identify him with Molokh, the Baal of Syria, the Sut of the Hyksos, and Sutekh of the Khitans or Hittities. (18) He was the best esteemed divinity in Northern Egypt, and bore such titles as "the beloved of the world," "the most glorious son of Nut," and "great ruler of Heaven," and his terrestrial reign was commemorated as most beneficent. The hatred with which the Hyksos and Khitans were regarded and the ascendency of a new regime in Egypt served afterward to deprive him of his honors. Gods who have been dethroned become personifications of evil. Seth was transformed, in the tragedy of Isis and Osiris, into Typhon, and became the Satan of the Asiatic countries under Egyptian influence. Nebti or Nephthys, the mother of Anubis, was his consort. Her name signifying "mistress of the house" would seem to assimilate her to Onka and Hestia as regent of homes. She was always described as loving and good, and on the monuments she was styled "the benevolent, loving sister." 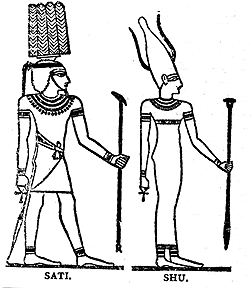 Hor or Horos, the son of Isis ami Osiris is variously personified. He was Hor-em-Khuti or Harmakhis, the Horos or sun of the meridian, Hor-pe-khruti or Horos the child, (19) and sometimes Har-oer or Aroeris, the brother of Osiris. He took the place of Ra in many places, even being adored as Ra-Har-em-Khruti at that god's temple in Heliopolis. He was also depicted like Ra with the hawk's head, especially after the Theban ascendancy had blended the two worships. In his reign the Amazons from the extreme West, it was affirmed, marched through Egypt in their career of conquest. He having been made the successor of Seth or Typhon, later legend made him the adversary and conqueror of that divinity and the avenger of Osiris. His consort, Hathor was the Venus or Aphrodite of Egypt. Her designation, Hat-Hor, the place or abode of Horos (20) not only indicates her as the consort of that divinity but in a completer sense as the personification of the material or maternal principle of the universe. Her temples were all over Egypt, and she was the special goddess of Egyptian queens. She personified all that was beautiful, and likewise all that was true. She was also mistress in the world of the dead where Osiris was the judge. (21) Her statue was a womanly figure with the head of a cow, having crescent horns with a disk between. In one hand was the ansate cross, and in the other a lotus-sceptre. 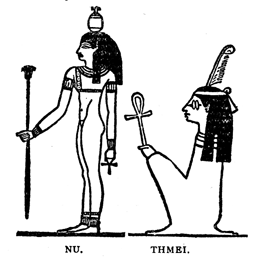 She was often identified with Isis, Neith and other goddesses; and Ebers accordingly represents Rameses and others in Uarda speaking of them all collectively as "the Hathors." She was the divinity most celebrated for acts of beneficence and was the most esteemed of any in Egypt. 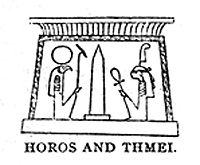 Every place of any note had its temple to Horos and Hathor. This enumeration, it should be borne in mind, is a summary of conditions, preserved in later periods as a description of the prehistoric period. We may consider it a form of history in the nature of parable, having an enigmatic sense with more or less of a profounder esoteric meaning. It certainly has furnished a foundation for the philosophemes of the Alexandreian period, the teachings of Plotinos and Porphyry, the Theosophy and Theurgy of Iamblichos and the speculative systems of other sages. The succeeding period in Egypt was known as that of the Hor-em-Shasu or Hor-shasu, the "successors of Horos." It lasted according to Manetho, 13,900 years. Thoth or Hermes the reputed patron of literature was the first of the series. Twelve of these lesser divinities were enumerated in this category, after which began the reign of human rulers. These were denominated, Nekyes; hardly "dead men," we may presume, or the wraiths of dead men, but individuals of superior character and ability, who had at their death been judged worthy of honorable burial, and were honored as good demons and ancestral divinities. (25) They are probably members of the sacerdotal order and had been chosen to the kingly office by their people. Bitys is named by Manetho as the first of this number. He is also mentioned by Iamblichos as "a prophet to King Amun," the Hyk or supreme god of the Thebaid, and as interpreting the theosophy of Hermes. Professor Sayce explains the condition of affairs, that "the country of the Nile was then divided into a number of small kingdoms, inhabited by a race similar in origin and customs, and already possessed of a considerable civilization. The so-called granite temple near the sphinx of Gizeh, built of huge monoliths of Syenite granite exquisitely cut and fitted together, perhaps belongs to this remote period." He adds that it must have been originally a tomb (26) but when it was discovered in the sand in the time of Kheops, the builder of the Great Pyramid, the King seemed to have imagined it to be the shrine of Harmakhis, the Sphinx. "Even at that remote age the principles of architecture had been studied," he adds; "and the chieftain who lived on the edge of the Delta was able to have huge blocks of granite cut and transported for him from the distant quarries of Assuan." "The Sphinx itself probably belongs to that early time." As the Egyptians were nothing if not religious their kings were not considered as duly invested with regal authority till they had been formally inaugurated by the high priest of the principal temple, (27) it has also been affirmed that the priests exercised the authority of determining when a king had ruled long enough, and that he accordingly obeyed their command by suicide. Finally, one refused obedience and was able to establish the royal power above that of the hierarchy and so introduce a new state of affairs. The life of the sacred Apis, it was also said, was restricted to twenty-five years, after which he was drowned, and a successor procured. But the monarchs enumerated in the lists of the numerous dynasties appear often to be remarkably long-lived. Presently three principal religious centres were developed, to which those of the other districts became subsidiary. They were that of Seth in the Delta, that of Ra at Heliopolis, and that of Neph in the Southern nomes; the cult of Osiris being accepted by all. In time the several nomes or districts confederated more closely together according to racial affinity and mutual interests. 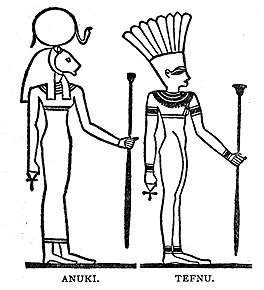 One focus of authority and influence was established at Teni and Abydos, and another at Annu or Heliopolis. Thus there were two Mizirs or Mizraim. One of these was sometimes denominated Kaphtor from its Phoenician relationships, (28) and the other Pathros, or the country of Hathor. (29) The way was thus prepared for the career which Egypt under her numerous kings and dynasties afterward achieved. Mr. Gliddon, in his Lectures, gave a summary of the condition of affairs during this period. "A theocracy or government of priests was the first known to the Egyptians," he remarks; and then proceeds to explain it. "It is necessary," he says, "to give this word priests the acceptation which it bore in remote times, when the ministers of religion were also the ministers of science; so that, they united in their own persons two of the noblest missions with which man can be invested — the worship of the Deity, and the cultivation of intelligence." After this admirable statement, Mr. Gliddon steps down from his lofty attitude, and adopts the modern fashion of accounting for the decadence. This sacerdotal rule became corrupt, he affirms, and so was succeeded by secular rule. "This grand political revolution," as he now terms it, "had over the social welfare of the people an influence most salutary and durable. From a sacerdotal despotism, that in the name of Heaven exacted implicit obedience to the privileged members of the Hierarchy, the Egyptians passed under the authority of a temporal civil monarchy, and acquired a constitution that rendered them free and happy." It is more probable, however, that the change was due to the people themselves. Mr. Gliddon's first description indicated the possession of the highest degree of freedom. When there is no king, it is said that every one does that which is right in his own eyes. It will be seen from Mr. Gliddon's own statements that the people, rather than their sacerdotal directors had become the party at fault. The Golden Period had waned, and those other ages supervened, in which men were less orderly and peace-loving. Sterner hands were required for such an exigency. Foreign invasion and its innovations were likewise disturbing the country on the North. In the decay of public virtue, the stress of affairs led to the demand for change. But the people had become less free in consequence. A similar account is given of the Israelites and their change from theocracy and sacerdotal government to monarchy. The matter is briefly stated by the prophet Samuel. (30) And the Lord sent Jeru-Baal, and Bedan, and Jephthah, and Samuel, and delivered you out of the hand of your enemies, on every side, and ye dwelt safe. And when ye saw that Nahash the king of the children of Ammon came against you, ye said into me: 'Nay; but a king shall also reign over us;' when the Lord your God was your King." Mr. Gliddon did not support his statement by any showing of facts, but evidently deduced it from his own premises. The truth was, that kings of Egypt were themselves members of the sacerdotal body, who had been instructed in the temples, and that they were zealous about all matters of worship. Mr. Gliddon's own declarations further exonerate the priests from the imputation of being corrupt or despotic. The "Grand Revolution" was only a gradual change produced by these conditions, as he himself shows. "The royal authority was not absolute," he tells us, "The sacerdotal order preserved in their councils their rightful positions. The military were there to maintain order and to strengthen the monarchy, but were citizen soldiers; and in the Great Assemblies (Panegyrics), wherein all religious, warlike, civil, administrative, commercial, political, statistical, internal and external affairs were periodically treated, the priests, the military, the corporations and the people were represented, and the interests of all were protected." Bunsen assigns three stages of organic development to the prehistoric period; first, the Sacerdotal Kings, then the military rulers, and afterward, kings of the upper and lower country. There were forty-two nomes or minor kingdoms, afterward represented in the hall of judgment by forty-two assessors. Each of them had a government district in itself with a hyk or prince of its own. Mena or Menes is generally considered as the first monarch of a united Egypt. This, however, is sometimes disputed; and his name, it must be acknowledged, exhibits a suggestive resemblance to the names of eponymous leaders or ancestors in other countries, like Manu in India, Mani in Tibet, Manis in Phrygia, Manes in Lydia, Minos in Krete, and Mannus in Germany. Yet he was always recognized in the literature and traditions of Egypt as a real personage, and the events recorded of his reign were accepted as undoubted facts. The City of Teni, This or Thinis, near Abydos, has the credit of producing the chieftain who was able to establish a single jurisdiction over the whole country, (31) and "whoever has seen the rich plain in which the City of This once stood," says Professor A. H. Sayce, "will easily see how it was that the founder of this united monarchy came from thence." It was situated in a fertile plain, guarded on three sides by hills, and on the fourth by the river; and there was everything in abundance for the development of wealth and power. Here stood the chief temple, the Tomb of Osiris, and it was the focus of religious knowledge. From this place, Mena made his way northward down the Nile, passing the regions where Horos and Setii were said to have had their conflicts, and finally established his new metropolis in the neighborhood of the Sphinx itself. Much he seems to have encountered of strife and war, while he founded his new city and brought to it the gods that were thenceforth to be supreme in Egypt. Banking up the river at a bend, a hundred furlongs back of his contemplated site, he opened a new channel for it, half way between the two ranges of hills that enclose the valley of the Nile. Upon the land thus gained from the water, he placed the City of Men-nofer, (32) better known to us in its Greek form of Memphis. He also erected here a Temple to the Divine Creator, Ha-ke-Ptah (33) whose worship he established. Mena is described as having made important changes in the social habits as well as in religion. He introduced specific rites of worship, which are said to have been the first that were ever instituted in Egypt. He also promulgated a new system of laws declaring that they had been communicated to him by Thoth, the secretary of the gods. He appears likewise to have brought in a more free and refined way of living in place of the more simple mode of life of former times; and a later prince seems to have regarded him as accountable for the luxury and corruption of manners that existed in Egypt, some thousands of years afterward. Taph-nakht, a priest and subordinate prince of Sais and Memphis and High priest of Ptah captivated with the frugal habits of the Arabs, endeavored without success to procure their adoption in Egypt. He was led by the weakness of the earlier Assyrian dynasty, the twenty-second, to revolt, upon which the princes of the southern districts placed Piankhi, a descendant of the sacerdotal dynasty on the throne. Taph-nakht was reduced to submission and placed a pillar in the Temple of Amun at Thebes on which was inscribed a curse upon the name and memory of Mena for having induced the Egyptians to abandon their early simplicity of life. The latest record of Mena is a story of war. It is said that he was leading an expedition against the Libyans, when he was killed, some affirm by a crocodile, others by a hippopotamus. These accounts are suggestive of an enigmatic meaning — Seth, the advisary of Osiris was the tutelary god of the Delta and both these animals were included in his domain. Mena being a worshipper of Ptah and Osiris, was, of course, an adversary of the party of that divinity and therefore his peculiar fate may signify that he perished at their hands. He has left no monuments recording his exploits. This absence of evidence, all that we know having been obtained from the fragments of Manetho and the imperfect records in the rolls of papyrus, affords a warrant for severe criticism to throw doubt on the whole account. It is affirmed without corroboration, however, that the tomb of Mena has been discovered at Negada, and also tombs of other monarchs at Abydos belonging to two different dynasties. It would seem that the city which he founded, the public works that he constructed, the worship and code of laws that he promulgated, the numerous "Mysteries" which he caused to be established, the united Egypt itself, were monuments ample to preserve his memory. 1. Perhaps some readers may not be aware that this term "Semitic" is technical and relates to a form of development and not to any specific line of descent. No reference to the traditional sons of Noah is signified. The Arabian and Assyrian populations and their particular language are what is meant. "Semitism" is undoubtedly an evolution from an older "Hamitism," and to this fact undoubtedly many of the resemblances are due which are observed. No person who is conversant with the Hebrew writings will fail to perceive that the early Israelites were largely, if not chiefly, Hamitic in blood as well as language and customs.